Earth is the planet we live on. It is the only planet in the Solar System with liquid water on its surface. It is also the only planet we know to have life on it. Earth is also known as Terra. There is oxygen on Earth, and oxygen is necessary for life. The Earth is the only planet we know that has liquid water on the surface, but scientists are trying to find others. The Earth's axis is tilted which is why we have four different seasons. The Hoba meteorite in Namibia is the biggest known meteorite to crash on Earth in one piece. A picture taken by Apollo 17, a space shuttle. 1 How big is the Earth? 3 Why is there life on Earth? 4 What about the Earth's moon? 5 How long is a day on this planet? 6 How long is a year on this planet? 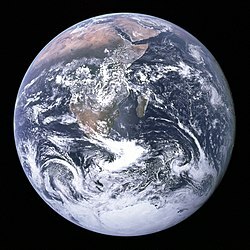 7 What is the Earth made of? 8 How much does the Earth's gravity pull on me? 9 Who is it named after? The Earth is nearly 13,000 km wide. It's the largest terrestrial planet in the Solar System. The Earth's mass is about 5,973,700,000,000,000,000,000,000 kg. That's a lot. But it is little compared with Jupiter (319 Earths) and tiny compared with the Sun (335,789 Earths) or other stars! The Earth's surface is made of rock. Most of it is underwater, but not all. Islands of rock rise up out of the water. The biggest islands are called continents, of which there are seven: North America, South America, Europe, Asia, Africa, Australia, and Antarctica. The largest bodies of water are called oceans, of which there are five: Pacific, Atlantic, Indian, Arctic and Antarctic or Southern. The Earth's surface is made up of huge plates. They are like huge jigsaw pieces made of rock. These plates move very, very slowly, carrying the continents with them. They can rub beside each other, push against each other, or even move away from each other. If there are gaps between them, hot molten rock can rise up and make volcanoes. Where the plates rub or push against each other, earthquakes may happen. When two plates push each other's rock upwards, mountains are formed. Earth has many kinds of environments. It is cold and icy in places like Antarctica. It is hot and dry in deserts like the Sahara in Africa and Death Valley in the United States. It is cold and dry in deserts like Siberia in Russia. Where it is warm and wet, rainforests grow. Wherever we have looked on Earth, we have found living things. They may be very small, like bacteria, but they are there. We have found bacteria where it is very cold, very hot, very deep, very high or very dark. What all living things on Earth seem to need is liquid water. Wherever you can find some water, there are almost always living things there too, even if you can't see them. If we find liquid water somewhere else in the Solar System, scientists think we might find some living things there too. If we don't, there is always the rest of the universe to explore! There is another possibility. All the living things we know need liquid water. But maybe somewhere else there are living things that don't need water. Perhaps we will need to learn how to recognize them. What about the Earth's moon? Earth has one moon we call... the Moon! Sometimes it is called by its name in Latin, Luna, so we don't get confused with other planets and their moons. The Moon has also been called Selene (pronounced "suh-LEE-nee") which is Greek for moon and was the name of the Greek moon goddess. Recently we have also found some other objects that are said to go around the Earth. The largest one, called Cruithne (pronounced "cru-EE-nyuh"), is three miles wide. In fact, it orbits (goes around) the Sun in a way that makes it keep coming close to Earth. There are various ideas about where the Moon came from (no-one was around to see it happen, after all), but the most widely held theory is that when Earth was young, a large body hit Earth and split off a section of the Earth that is now the Moon. A day on Earth is 24 hours long. That's daytime and night time. A 24 hour day is how long it takes the Earth to spin around once. On the half of the Earth that is facing the sun it is daytime and on the half of the Earth that is facing away from the sun it is nighttime. The spin of the earth is also the reason why the sun appears to rise in the east and to set in the west. Although it looks like the sun is moving from the surface of the earth, it is really the surface of the earth that is moving. The reason we do not feel like we are spinning is because the earth is so big compared to the size of people. Also, the Earth is tilted at about 23°, so there are times that the North or South pole is always facing or turned away from the sun. If you live at one of the poles of Earth it can be light or dark throughout the whole day! A year on Earth is about 365 and 1/4 days long. That's how long it takes the Earth to orbit the Sun once. Approximately every four years we have a leap year. A leap year contains an extra day in our calendar on February 29th in order to account for the 1/4 of a day left over each year. When a planet is made of rock, we call its surface the crust. Below the Earth's crust is hot rock, some of which is molten. It is in a layer called the mantle. The hot molten rock is what comes out of volcanoes. It's then called lava. Under the mantle is the core of the Earth. We think it is made from solid iron and nickel, surrounded by hot molten iron. The temperature there is very very hot! The Earth's crust is very thin compared to the mantle and the core. But it is very thick to us. Nobody has drilled all the way through it yet. Even the deepest underground mines are far away from reaching its deepest base. How much does the Earth's gravity pull on me? It's easy to find your weight on Earth by using a scale. You have weight because the Earth's gravity pulls you towards its center. Normally, the ground or the floor get in the way, making you feel 'stuck' to them. 1) Comparing of 2 masses (weights). You put the thing(s) you want to weigh on one pan (like some marbles), and then you put several "weights" on the other pan until the pointer shows that both pans have equal weights on them. Then you look at the pan with the known weights on it, and add them all up. The total is the mass of the thing(s) you want to weigh. 2) A spring balance usually has a hook on it, with a pan. You put the thing(s) you want to weigh on the pan, the spring is pulled, and the greater the weight, the further the spring is pulled. That distance, calibrated in pounds or kilogram (or whatever), is usually shown either on a dial or on a linear scale. 3) There are also electronic scales that give a properly calibrated reading—grocery stores, for example, use these. NOTE: Gravity varies slightly depending on the location where you want to get the weight; spring balances and some electronic scales can, in theory, read slightly different weights at different places because of that, but usually in practice that difference is too small to be noticed. But, because the balance type of scales work differently from the spring or electronic types, they will always read the true, correct mass. They would even give the same mass on the Moon, where gravity is much less than on Earth. Did you know? that Sir Isaac Newton was the first person to realize that the force pulling you down to the ground was the same force that keeps the planets going around the Sun? The story goes that he thought of this when he saw an apple fall from a tree. Gravity is a very important force. As well as keeping you firmly stuck to the Earth, it keeps the Moon going round the Earth, The Earth going around the Sun and the Sun going around the center of the Milky Way galaxy. Gravity also makes stars and planets a nice round ball shape. In fact without gravity there wouldn't even be a Sun, Moon or Earth because the material that they are made of would just float away into space. The word earth is used for both planet Earth and soil. Other names had been used for Earth such as Gaia, Tellus and Terra. Gaia is the Greek goddess (meaning Mother Earth) and Terra is the Roman name of the same goddess. Tellus is the Latin for "Earth", many scientific words dealing with Earth will be derived form Latin. This page was last edited on 13 April 2018, at 11:07.